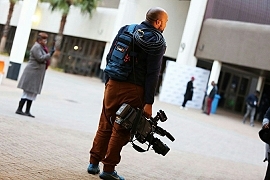 eNCA South Africa chooses LiveU's video transmission solution. Hackensack, NJ, July 2017: eNCA, South Africa’s largest news organisation with over 16 million viewers, has chosen LiveU’s flagship LU600 solution to extend its breaking news coverage around the country. With South Africa’s operators rolling out LTE, LiveU’s cellular bonded technology offers a high-quality, reliable and cost-effective HD solution for mobile newsgathering. The deal is being managed by LiveU’s South African partner Concilium. LiveU is presenting its live IP video uplink services and streaming solutions at Mediatech Africa, Johannesburg (19-21 July), on its partner Concilium’s stand, E17. Alexander Gechtman, Regional Sales VP of LiveU, will be speaking at the Mediatech conference. The Topic is “Technological advances in cellular based live news and event coverage – unique hybrid transmission solutions” and will be presented in Presentation Zone 1 on Wednesday 19th July at 12:30.